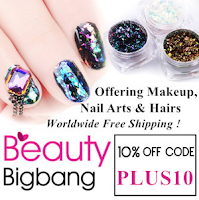 When BeautyBigBang asked if I would like to try some of their chrome polishes I was like 'Yes pleeeeeaaassseee' They all look really pretty and I always have hype space for pretty metallics. This is Green Metallic, the first of three polishes that I was sent and it's a bit of a beaut. Look at that gorgeous colour. In terms of it being a chrome, it is, sort of. It comes with a base polish which is kind of an activator for the chrome, without it it's pretty much just a standard metallic polish. The base polish takes about 10-15 minutes to dry, which is quite a long time to wait but you have to have it completely dry before you apply the chrome polish but once you apply it, it transforms. The polish dries really quick and although there are serious brush strokes when you apply it, they all but disappear by the time it is dry. I applied two coats with no topcoat. Sadly, the moment Seche touches it, it completely loses the effect, but although I haven't tried it, I expect it would hold up pretty well with a gel topcoat. Topcoat would be needed if you wanted it to last longer than a day. Ok, so lets be real, it's not true chrome like what is/has been achieved with some of the glitters and powders out there but it's pretty darn close. 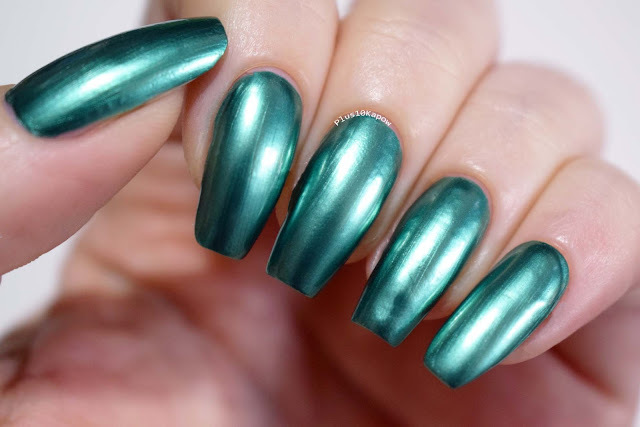 You can find the Green Metallic Chrome polish here for £5.41/$6.99 and you can use my code PLUS10 to get 10% off your order. Keep an eye out for the other two chrome polishes in the next few days. love the green effect on your nails!